I love Gen Con. I really do. Sure, it's a ton of work for me and at the end of it my feet are totally destroyed from all the walking around I've been doing, but I still look forward to it every year. It's a great chance to meet up with old friends and just revel in our love of all things gaming. Well, if you're not going to work at the show, but want to make sure you get the full amount of exposure to all of the things going on, you don't have to look much further than Geek Nation Tours. 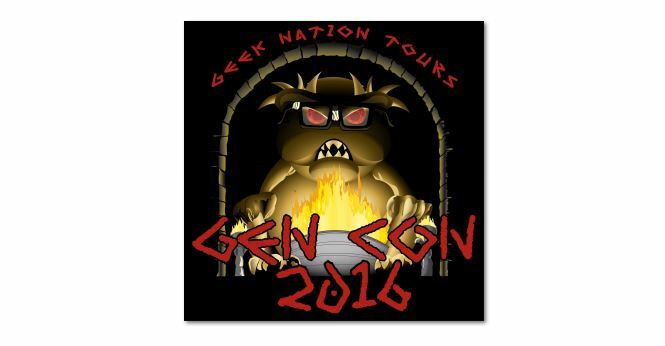 They've posted up details of this year's Gen Con tour. As usual with Geek Nation Tours events, they have a whole bunch of things planned each day of the show, and even days leading up to the show. There's plenty of exclusive events that only tour members will be able to partake in. Meet with gaming insiders. Play some of the newest games on the market. Eat at some of Indy's finest restaurants. Got a loved one that isn't so much into gaming, but they want to go as well? GNT has non-gaming-related things for them to do as well. Booking is going on now as well. Spots will fill up fast, so be sure to register early.